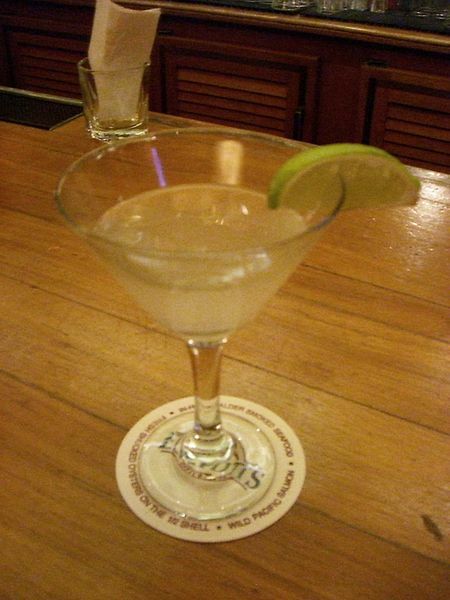 The daiquiri is a classic rum cocktail, consisting of white rum, lime juice, and sugar or syrup; it is a basic rum sour. It is particularly associated with Cuba and with Ernest Hemingway. Classically it is a simple drink (a rum sour), served in a cocktail glass; it also exists in numerous variations, and is often blended with fruit and ice to make fruit daiquiris. The drink became popular in the 1940s. Wartime rationing made whiskey, vodka, etc, hard to come by, yet because of Roosevelt's Good Neighbor policy (which opened up trade and travel relations with Latin America, Cuba and the Caribbean), rum was easily obtainable. As a consequence, rum-based drinks (once frowned upon as being the domain of sailors and down-and-outs), saw a tremendous rise in popularity in the US. Daiquiris are commonly blended with crushed ice and fruit to make party drinks, or rather, a rum-based blended ice and fruit drink is conventionally called a fruit daiquiri; this is analogous to tequila-based blended ice and fruit drinks being conventionally called fruit margaritas. Examples include the banana daiquiri and strawberry daiquiri. Virgin (no alcohol) fruit drinks are often referred to as “virgin fruit daiquiris”, as in the virgin strawberry daiquiri. Pour all ingredients into shaker with ice cubes. Shake well. Strain in chilled cocktail glass. Serve in a cocktail glass, straight up; without ice. Daiquirí Natural is the basic mix, that serves as the starting point to the more complex cocktails of the family: 1.3 oz (40 mL) light-dry rum, 0.7 oz (20 mL) lime juice, 1 teaspoon (5 mL) sugar, crushed ice. Mix the ingredients in a shaker and serve. Daiquiri Floridita is the most common and famous version of this cocktail. This recipe is also known as Daiquirí Frappé: 1.5 oz (45 mL) light-dry rum, the juice of 1 lime, 1 tsp (5 mL) sugar, crushed ice, 10 drops of maraschino liqueur. Mix all the ingredients in a blender until the ice is finely crushed and serve iced. Papa's is the version of the cocktail that Hemingway allegedly preferred (Papa is the nickname that fishermen gave Hemingway in Cuba). Identical to the Floridita Daiquiri, it only substitutes lime juice with grapefruit juice. It is said that Hemingway drank this cocktail with no sugar and doubled the rum. Mulata is the same cocktail as the Floridita Daiquiri, but instead of light-dry rum (which is colourless) it requires aged rum, which gives the cocktail an amber colour.